As with most animal portrait painters, animal rescue is closely tied to my work as an artist. I was completely uneducated about Siberian Huskies when I chose to take two of them home. Long story short, they taught me a lot about pet ownership. Siberians are special animals and require strong guardians who are vigilant and active. Seeking advice on facebook for how to deal with my huskies (instead of giving up on them in spite of some very serious situations in which the dogs and our family found ourselves in), I found a support group for husky owners where I was given lots of advice that allowed me to keep my dogs. This group also alerted me to the very ugly reality of pet abandonment and overpopulation. I met the husky “Hero” (ARA – CA rescue) and decided to paint his portrait on a poster and allow ARA to sell these posters (which I numbered and signed individually) to support Hero’s care. This caused others who saw my work to request paintings of their own animals. This is how I became a pet portrait artist. It was a happy accident that I owe to my “sibes” and to the animal rescue group Allie’s Rescued Angels for helping me reach out to an audience of animal lovers to make a living that I can feel good about. Hero did not make it, but I personally helped ARA raise thousands towards his care with the sale of those posters and the commercial rights to the graphic (which money was given directly to ARA for their use). His death has given life to many dogs in the years since – he inspired me to give regularly and with enthusiasm to animal causes and keep those food bowls filled. Therefore, I owe a lot of who I am and what I do to the animals and rescue foundations. I will donate as much of my time and energy as I can to supporting worthy animal causes. Art isn’t art if it has no heart, after all. 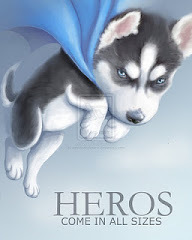 Hero The Husky posters were sold (hand signed and numbered) in 2012 to benefit Allies Rescued Angels.